Hope everyone’s week is off to a great start! I’m thankful we’re halfway through the week because mine has been super busy with lots of meetings and paperwork. Boo. We pretty much ran out of everything in our fridge/freezer last week, so my usual oatmeal in the morning was a no-go (i.e., no almond milk). 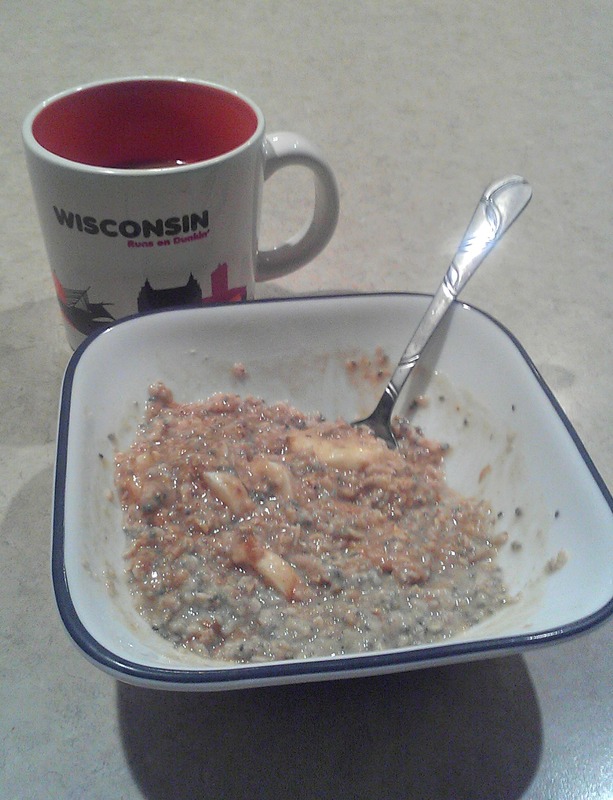 I’m addicted to oatmeal with almond milk, chia seeds, pumpkin butter, and banana. Mmmmmm. With a side of coffee, of course. Instead, I decided to try making protein pancakes. I like to eat something filling in the morning because I hate hunger pains mid-morning. My therapy schedule is pretty “go, go, go” so I don’t have a lot of time to sit and eat a snack. I try to eat a Kashi chewy or KIND bar at 10, but somedays it’s 11 or 11:30 before I have a chance to eat something. These pancakes are filling, quick to make, and taste delicious! Mash the banana and egg together until combined. 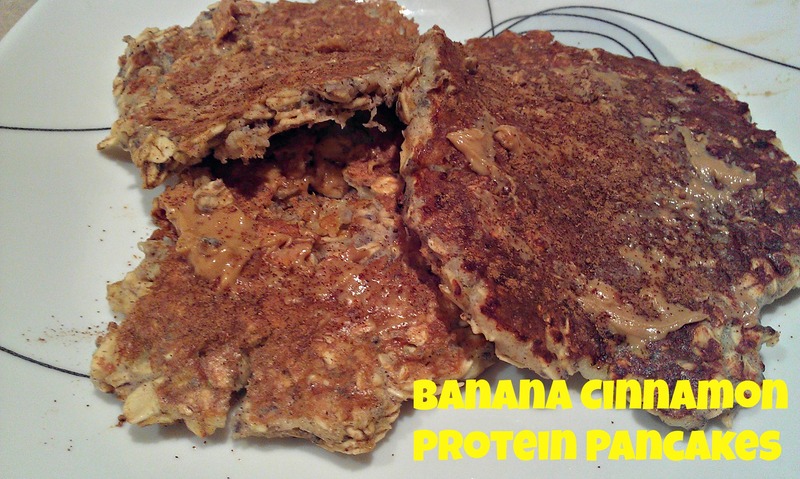 Mix in oats, chia seeds, and cinnamon. Pour 1/4 cup of batter onto a skillet (medium heat). Wait until bubbles appear, then flip pancake. Sides should be a golden/dark brown. Top with anything that floats your boat! I used peanut butter, but you can add nuts, syrup, almond butter, pumpkin butter, greek yogurt, pretty much anything! Hey fellow bloggers, did you know that it’s now October? I’m relatively new to blogging, so I never knew a new month was such a big deal in blogland! Pretty sure almost every post I read yesterday mentioned the month changing. Yes, we know. 🙂 Yes, it’s amazing, but it also means winter is coming and that’s not cool. I also saw this quote floating around Twitter…hilarious because it’s so true! 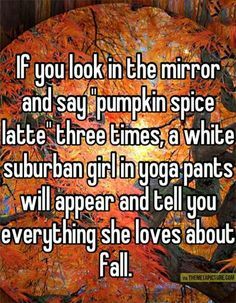 And I’ll admit I’m one of those girls (just minus the latte and add “coffee”)! What’s your favorite filling breakfast? Are you in favor of Fall or is it over done on blogs? Good morning! How’s your Tuesday going? I am marking the days until I go back to work (ek, 2 weeks!). I’m an SLP in an elementary school and have really been enjoying my summer off! Last week hubby and I picked up some huge, plump zucchini at the farmer’s market. Although I am a fan of zucchini chips and we just ordered a dehydrator off of Amazon, I was looking for something else to make with my veggie. I took to pinterest and found a recipe that looked easy to modify. Find the original recipe from everydayfoodstorage.net here. 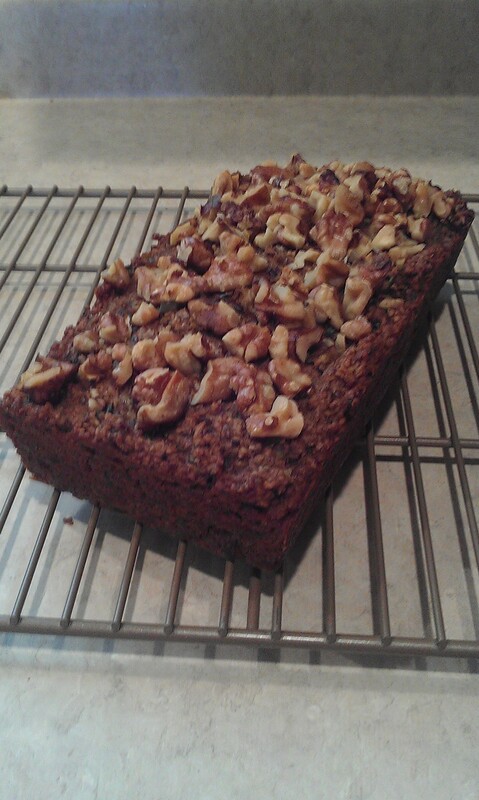 A baking element went kaput in our oven last week, so luckily my dad lives close by and let me use his oven. We are just getting our oven back today, a whole week later! I know, how did I survive without baking? It was hard, let me tell you. This bread turned out so well! I cooked it in my dad’s oven, but didn’t leave him any because I wasn’t sure how it would taste. I replaced the whole wheat flour in the original recipe with oat flour (I grind my own). I am not completely gluten free, I just try to limit the amount of gluten I consume. My oats are not certified GF, but make sure yours are if you have to eat GF. I also replaced the egg with a chia egg (I TB chia seeds + 3 TB water). Was this necessary? No, not at all, but I love trying something new/different in recipes. This was my first attempt at baking with a chia “egg.” I was pleasantly surprised with the result! The bread is very moist from the zucchini and tastes sweet, but not too sweet. I am definitely going to make these into mini muffins ASAP. I’m slightly in love with mini muffins. They’re so small and cute! Preheat oven to 350 degrees. Grease one 8x4x2 inch bread pan with non-stick spray. With electric mixer, mix together butter, applesauce, and sugar. Beat until smooth. In another bowl, mix together flour, cinnamon, nutmeg, baking soda, baking powder, and salt, put aside. Add chia egg and shredded zucchini to wet mixture until mixed. Add the flour mixture to wet mixture until just combined. 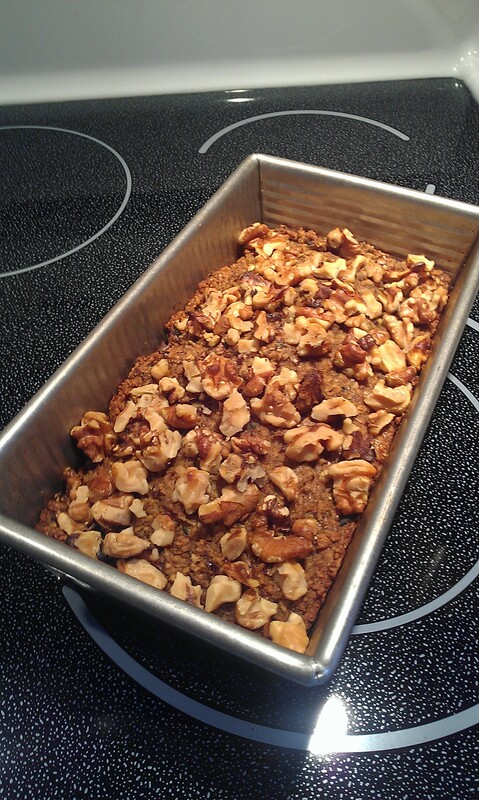 Pour batter into bread pan and top with walnuts. Bake 55 to 60 minutes, until toothpick inserted into the center of the loaf comes out clean. Remove from oven and let sit about 10 minutes to cool. Enjoy! You can add butter or jam to slices, or eat by itself. I’m always a fan of recipes where I have all the ingredients on hand. This bread was very easy to throw together and my hubby gave it a thumbs up! He had no idea there wasn’t AP flour or an egg in the bread. What have you been baking lately? Do you always stick to the recipe exactly or do you like to make recipes your own? Turkey Trot Recap & It’s My Birthday! Finding balance between life, fitness, and fun!